Do you struggle to keep up with your Twitter activities? Interested in tools to improve productivity? Managing your Twitter account doesn’t have to consume all your time. There are tools that can make the work easier. 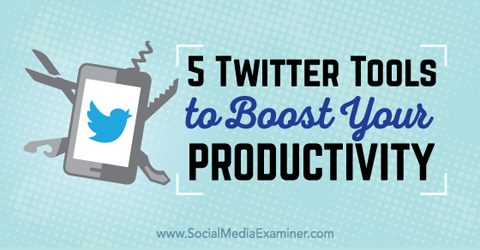 In this article you’ll discover five Twitter tools to boost your productivity. Discover five productivity-boosting Twitter tools. Tweet Jukebox is a free scheduling tool that allows you to load a “jukebox” with content, schedule when you want tweets to go out and then sit back and let it do the job for you. You can create more than one jukebox, load it with thousands of tweets and then send out as many as 100 tweets per day. Your account comes preloaded with two jukeboxes, one with photo content and one with quotes, to get you started. 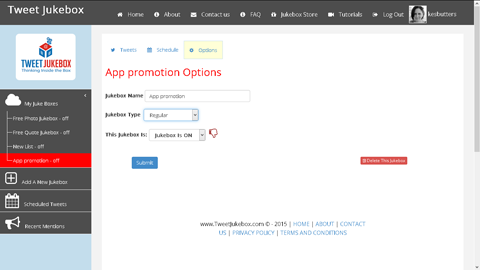 You have the option to tweet jukebox content once, regularly or until a specific date. Add a name for your new jukebox, choose how often to tweet and then turn the jukebox on. 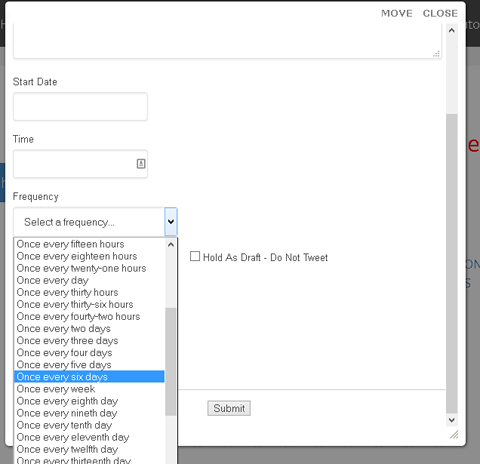 Tweet Jukebox allows you to set schedules for different times on different days of the week. When it runs out of content, it automatically starts tweeting again from the beginning. The scheduling engine is very flexible. Set a scheduled tweet once a year on a specific date (think holidays and annual events), or choose to tweet by frequency. You can also set a time for each tweet to go out, depending on user engagement. Choose a frequency for your tweets. 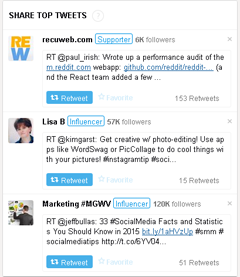 Tweet Jukebox also lets you track who has mentioned you. This can be visualized by the tweets themselves, or shown in a graph format. 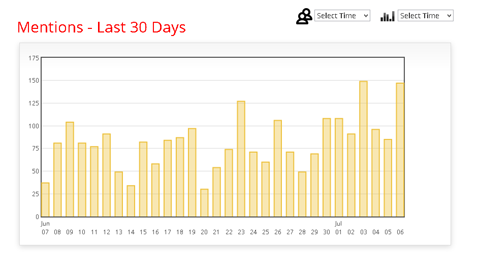 Choose from mentions in the last 7 days, 30 days, month or previous month. See your mentions for different time intervals in graph format. The Jukebox Store allows you to download preloaded jukeboxes with content from other high-profile users. Download preloaded jukeboxes from influential users. Another handy feature is the ability to thank up to 50 users every Friday. Spruce is a free, easy-to-use tool that allows you to quickly create images with custom text for Twitter (and Facebook). Choose an image from the library, add your text, preview your post and publish it. It’s as simple as that. Spruce makes it easy to find images and add your own text. Spruce allows you to upload your own images and download completed images for later use. You can check the post and add text before publishing it. Keep in mind that you don’t have to tweet using the service, so you can create and add them to your scheduler, too. Editorial Note: This tool is no longer available. 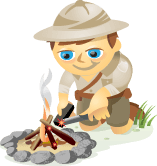 ManageFlitter is a highly useful tool for managing your followers and posts. The functionality of the free account is pretty good. Or you can choose from two levels of paid accounts to get more features, including analytics. In the left column of the main dashboard, find out more about your followers by exploring different views, such as Not Following Back, No Profile Image, Inactive, Fake (Spam), Influence and Muted Users. This allows you to easily unfollow accounts that don’t offer any benefit, identify spam followers and more. For example, suppose you want to find people you’re following but who aren’t following you back. Choose the Not Following Back option to see a list of users to check out and unfollow if necessary. 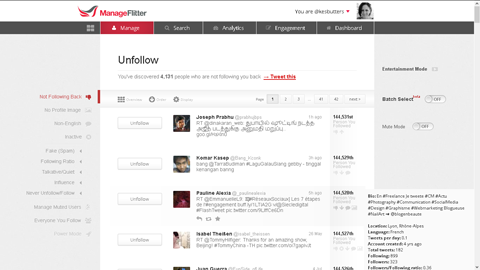 Use ManageFlitter to see accounts you’re following but don’t follow you in return. 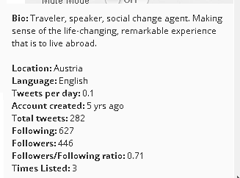 Hover over a user’s name to bring up details about that person, including his or her bio, location, language and average number of tweets per day. Hover over a user’s name to view details about the account. You can use ManageFlitter to post using the PowerPost feature, which tells you the best times to post based on users’ activity. Use PowerPost to tweet at optimal times. Additionally, you can post suggested content that’s based on your niche, add an RSS feed to find further content (although you can’t post it directly to Twitter) and view your queued content so you know what’s scheduled. You can also connect your Google+ account so that it posts straight to Twitter for you. 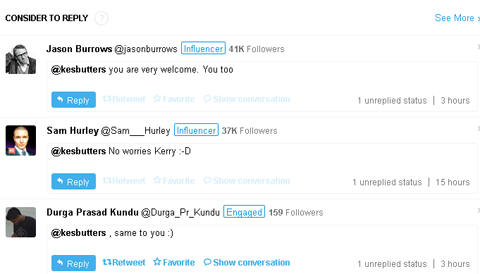 Commun.it is a Twitter relationship management tool. There are three paid plans to choose from, depending on the features you need. You can also access and use the free account, with limited functionality. The dashboard is full of useful information. The view below shows the Actions tab, which allows you to see at a glance who to follow, unfollow or engage with based on the tool’s suggestions. 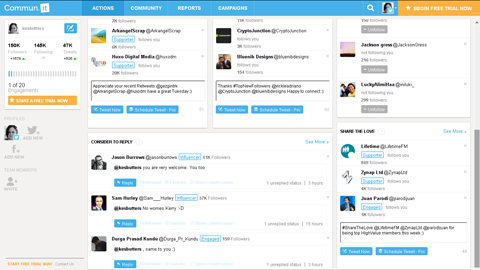 The Commun.it dashboard provides insight about your Twitter relationships. Influencers and engaged users are labeled so it’s easy to identify who will share your content, extend your reach, etc. Influencers and engaged users are labeled to make it easy to identify them. The Community tab gives you additional engagement options by displaying a prioritized feed that brings important users to your attention. You also see a list of well-performing tweets you might want to share. See a list of suggested tweets to share with your followers. On the left side of the screen, there’s a menu with options to help you choose people to engage with and to unfollow. You can also see who has mentioned or retweeted you, new followers and more. The categories are helpful for identifying influencers who may share your content, as well as for finding your most engaged followers. View user information to decide whom to follow and engage with. Commun.it gives you a basic, three-day reporting feature on the free account. If you sign up for a paid account, you can set custom ranges. 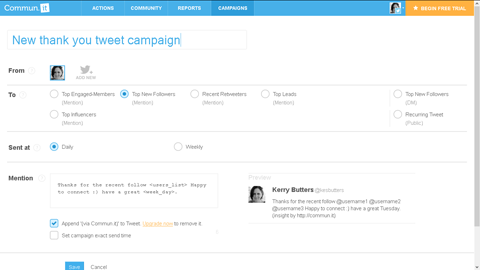 The Campaigns tab allows you to set up scheduled thank-you tweets for top followers and retweeters, daily thank-you tweets and Friday follow-ups. These are all free to use and loaded into your account. If you don’t want to use the preloaded text, you can craft thank-you tweets that better suit your brand by clicking the New Campaign button. Set up your own customized thank-you tweets. RiteTag is a hashtag tool that allows you to view statistics on hashtags to find the best ones for each post. With the free account, you can connect one Facebook and Twitter account, while the paid accounts allow you to connect multiple accounts. After you install the browser plugin, go to the site you want to share and click the RiteTag icon on the browser’s toolbar. This brings up a dialog box with the site URL and description. You can then add text and hashtags. Use the RiteTag plugin to open this dialog box. There are tools in the dialog box that enable you to research hashtags and get statistics. This gives you an indication of how popular specific tags are and how likely you are to get engagement. You can also schedule a post from within the dialog box so you don’t have to leave the site that you’re on. Click the graph icon to open a new window with additional details on a particular hashtag. This brings up stats about the hashtag based on its engagement in the last 24 hours. 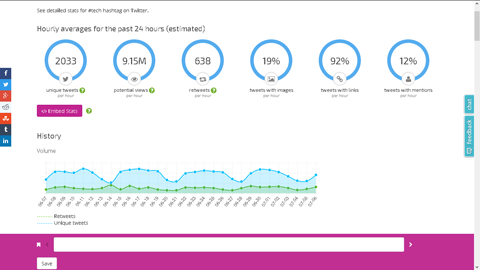 View detailed stats about a particular hashtag. Scroll down to see which influencers have used the hashtag, how often it’s been used in images and mentions and what other tags it’s been used with. A simple legend shows you whether your hashtag is a good choice. A color-coded legend makes it easy to evaluate your hashtag. On the site (not the plugin), use the My Intel tab to track hashtags and see what engagement they’ve received, in which tweets and at what times. 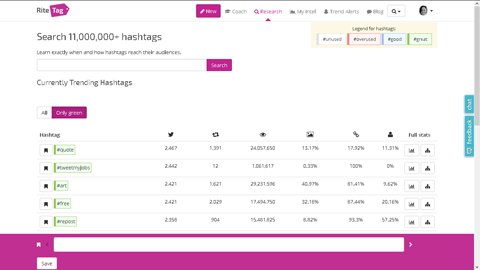 Using the Research tab, you can search a database of more than 11 million hashtags to see their stats. Research individual hashtags on the RiteTag website. You can monitor tags you use frequently (such as your brand tags) and get alerts when they’re mentioned on social channels. Create alerts for specific hashtags. The scoring of hashtags helps you determine when a tag has become overused so you can choose another that will work better for your brand. Finding time to successfully manage your social media accounts can be challenging. This is especially true if you’ve built up a decent-sized, engaged following. There are plenty of well-known time-saving tools that others will recommend, such as Hootsuite, Buffer and Rignite. 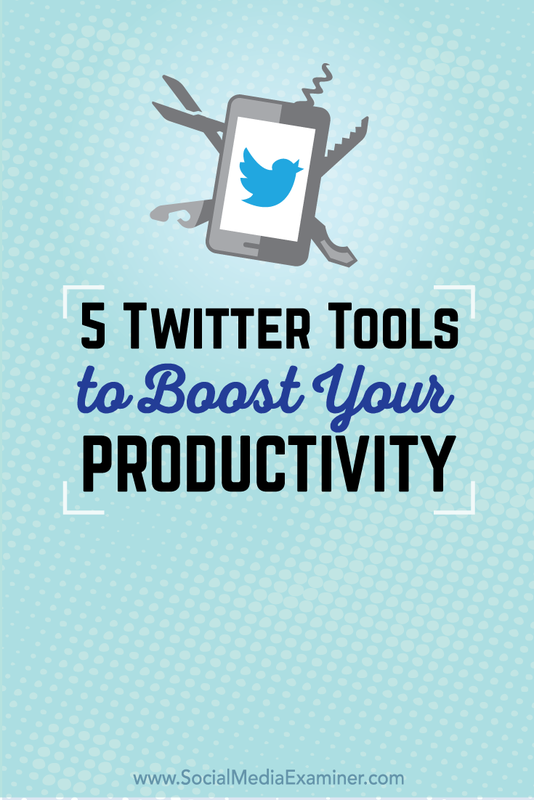 This article focuses on some of the lesser-known tools for boosting productivity on Twitter. What do you think? Have you tried any of these tools? Which productivity tools do you use with your Twitter account? Please share your thoughts in the comments below. Five tools to boost your Twitter productivity.